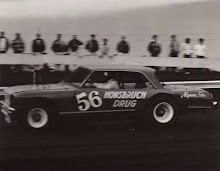 Cedar Rapids, Iowa (April 25, 1971) - Ron Hutcherson of Keokuk gave himself a belated birthday present Sunday by capturing the Hawkeye 200 late model stock car race at Hawkeye Downs before a paying crowd of 6,212. Fred Horn, though, found no reason to celebrate. The Marion chauffeur protested the results, contending he was the winner of the International Motor Contest Association annual classic. However, National Speedways, Inc., officials disallowed the protest and Horn had to settle for second place in the 100-miler on the half-mile dirt oval. Hutch and Horn finished on the same lap. Third place went to Keokuk's young Mike Derr, 23- year-old son of Ernie Derr, the 11-time IMCA champion. It was a feather in Mike's cap as he completed 198 laps to papa's 195. Both drove 1970 Chargers. Ernie finished fourth, after experiencing rear end problems early in the race. 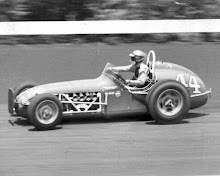 The point of Horn's protest began on the 93rd lap when a broken ball joint stalled Mel Morris of Atalissa in the third turn and the yellow flag came out. 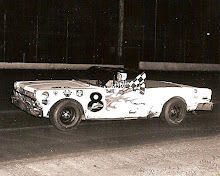 Horn pitted his '70 Road Runner under the yellow, trailing Hutch, the leader, and Ernie Derr. Hutch and Derr hit the pits for fuel on the next lap and both were out quickly, nearly simultaneously. "I know Hutch passed me while I was in the pits," Horn fumed, "but then I passed him in the pits. Then he passed me and I passed him and he never got around me again." 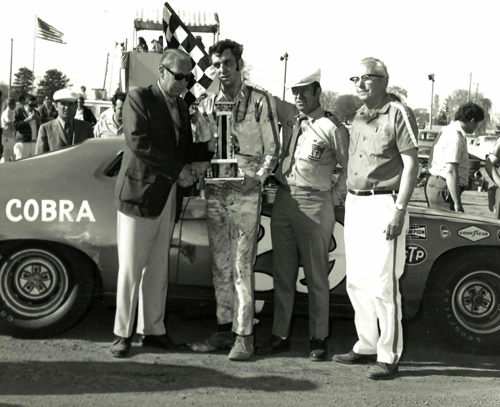 The margin of victory for Hutch and his 1970 Ford Torino Cobra was a mere nine seconds on the extremely dusty and rugged track. His time was one hour, 32 minutes and 35 seconds. "I'm tired, but happy," smiled Hutch as he wiped the grime from his face. "This is a pretty good birthday present," he added, explaining. He turned 28 Saturday. It was Ron's first race of the season and he allowed, "The first one is always tough! No, I didn't have any special strategy, except I wanted to stay in there tough at the start. I always run better late in the race. "That's when the tracks usually get hard and slick and that's the way I like 'em. I had Goodyear tires on and they work better when the track is hard and dry ... We could have done without the dust, though." Hutch, who picked up $800 for his triumph, was the third and final leader. 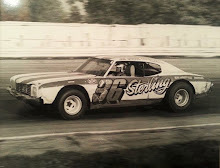 He took over from Irv Janey of Cedar Rapids ('70 Road Runner) on the 87th tour. Janey was flying up to that point and had led the pack for 57 laps. But a broken lower control arm took away hi steering and any chance of winning were shattered. 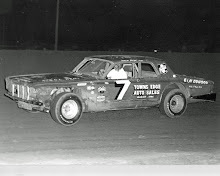 The early leader was Gerry Harrison of Topeka, Kan., in a '71 Ford. Horn topped the qualifying with a 25.54 second clocking for one lap, well off the Downs record of 24.57. Thirty-two cars started the race. Only 12 were running at the finish.